What we know as the skull and crossbones, with the human skull and the two long bones, was actually commonly referred to during the 17th and 18th century as the Jolly Roger. This flag was flown to identify a ship’s crew as pirates that were about to attack. Although we see the skull and crossbones across a black background in popular media culture, real pirates usually just flew a black flag to identify themselves. It was used mainly to frighten their victims into a surrender without having to engage in actual combat. The Jolly Roger was specifically flown by Edward England, who was a Irish pirate that sailed around the African coast and Indian Ocean. 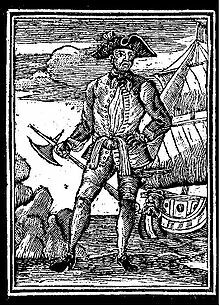 His ship was called the “Pearl” and he would always fly the Jolly Roger to let others know his fearsome occupation. An 18th century woodcut of Edward England.